Micropolis is a LEGO building standard which allows for large-scale collaborative builds of microscale cities. The usual module sees a 16×16 base with roads down two sides, leaving a 14×14 “development site”. Tammo S. has used the space to great effect with this 70s-style office block. The curving balconies and the colour scheme are totally retro, and very cool. 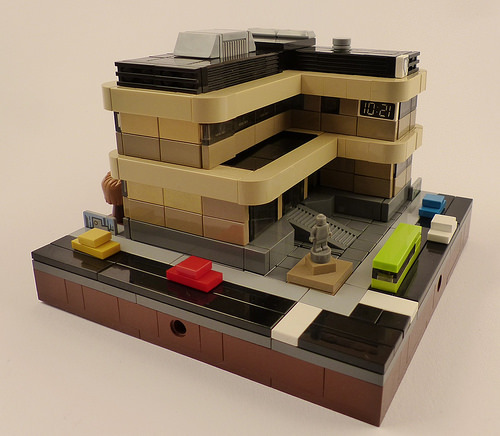 And don’t miss the little touches like the use of the clock tile, and angled grille bricks as steps — the sort of things that elevate a microscale model out of the ordinary. This office might be beige, but it’s anything but bland. My only criticism is the lighting on the photo isn’t great. But that doesn’t detract from a lovely model. The footprint would be 13×13 studs, by the way – as there are 2 studs used for road, and 1 stud used for pavement in LBG.